Let me start out by saying I was a mess! I was depressed! Didn’t want to go anywhere! Every piece of clothing I had was baggie and ugly!I had it because I was limited on what I could buy to cover my 300 lbs body! I was just so miserable! I tried for years to lose weight and lost the same 50lbs over 1000 times I am sure. I always gained it back plus more. Was a crazy cycle and I was at the point that I could not lose it and wanted to give up. I remember crying in bed and asking God if I am supposed to lose weight help me find something that will work for me. I knew I wanted to go plant strong so I Google plant-based diet and found protectivediet.com! It was the best thing that ever happened to me. I tried recipes here and there at first and I found myself enjoying them. So I decided one last time I will try to change my lifestyle. I committed to 30 days! That is all it took to change my life! I have been eating Protective Diet for a year in May. The food was so good and easy to make! My cholesterol went from 180 to 123 after just a few weeks. My self-esteem went from thinking I am worthless to feeling I can do this! I am a strong person who deserves to be happy and healthy. I have lost 105lbs! 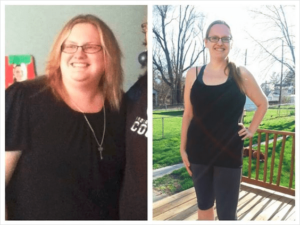 Protective Diet changed my life! I am in school now getting my nursing degree! Before Protective Diet I never thought that was possible.